The event was at the weekly Farmers Market, and 500+ people saw that we were having the plug-in electric car show. Due to the crowded venue, we didn't offer test rides. 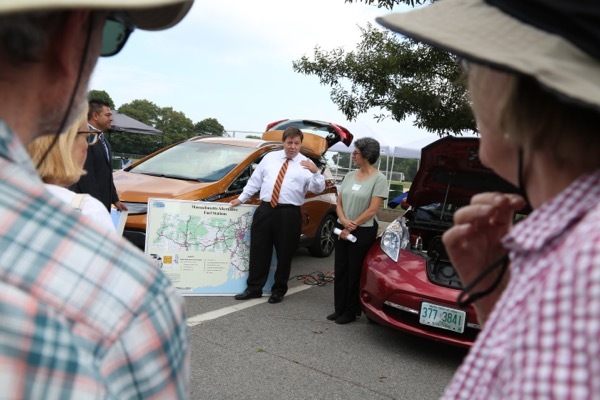 Many attendees talked to car owners/enthusiasts, a nonprofit organization that has a group buy discount program for EVs, a State representative that promotes alternative fuel vehicles for transportation, and car dealership sales people. Quincy's Mayor Koch thanked the businesses that currently offer public charging stations, and announced plans to install municipal public charging stations, including at the new Central Middle School, which is under construction. Join us for an electric car showcase at the Farmer's Market! We'll have information on hand about the cars, charging and federal, state and other incentives. Click the blue button above to register and you'll be entered to win a chance at a $250 gift card. Registered attendees report 38,556 electric miles driven.